As you begin the Fall 2018 semester, here are some important updates to Blackboard we’d like to share with you. All courses will now be created in Blackboard automatically. There is no longer a course request system. Your courses will be displayed in the “My Courses” area on the page after the login screen. All created courses are set to unavailable and must be turned on by the instructor when ready. You can do this using the Qwickly module (http://goqwickly.com/demos/) on the home screen of Blackboard or by going into the course and going to Customization -> Properties -> Availability. 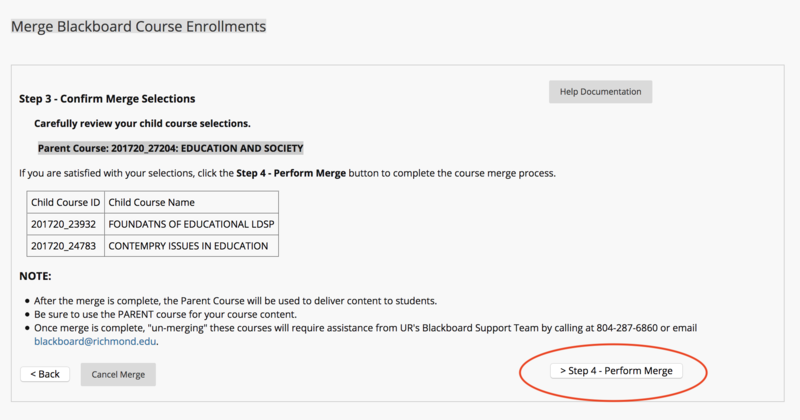 Information about merging and unmerging your Blackboard Courses. 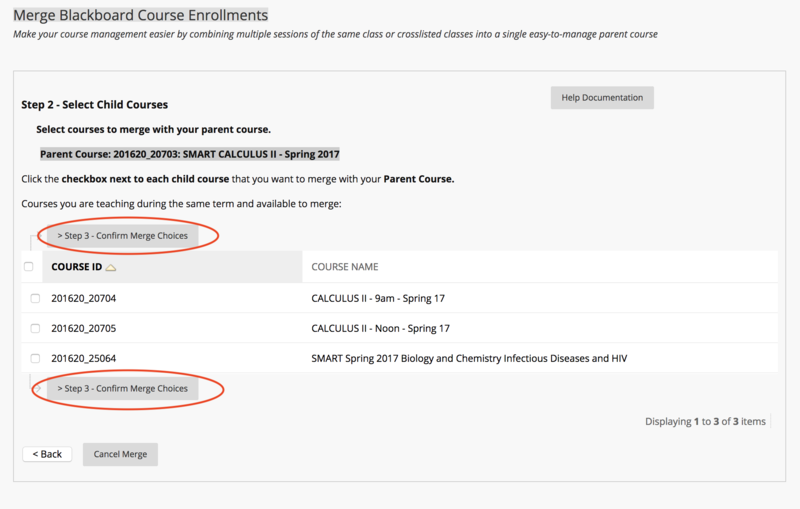 Instructors may use the Course Merge Tool when they want to merge enrollments of two sections of the same course (same department and catalog number) or merging different types of courses (two different departments and catalog numbers). Some instructors would rather manage class enrollments and content in a single Blackboard course rather than separate courses. 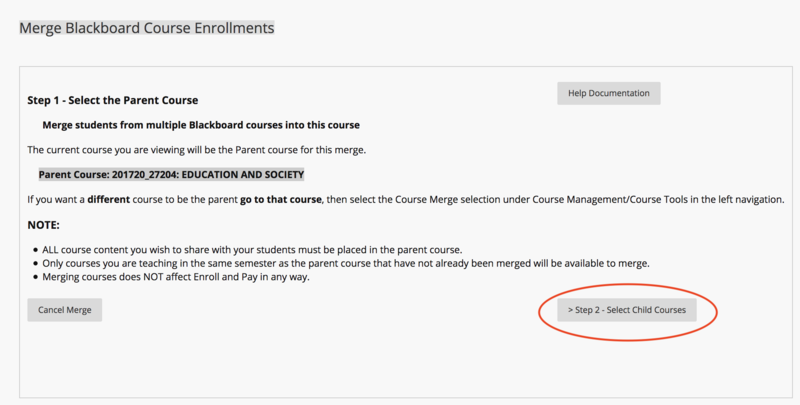 The Course Merge Tool copies the student enrollments from one or more “Child” Courses into a “Parent” Course. After merging the courses, students will see the content from the Parent Course. Students will see the course name as the course they actually enrolled in. All student enrollments from the Child Courses will be added to the Parent Course. The Course Merge Tool does not copy any content from the Child Courses to the Parent Course. Note: If you want to copy content from any of the Child Courses to the Parent Course you should do this prior to using the Course Merge Tool. After merging all content should be added to the Parent Course only. In order to merge courses, the instructor must be enrolled in the Child and Parent Blackboard courses as “Instructor”. The Child and Parent Blackboard courses must be listed in the same term in the Schedule of Classes. The Child Courses will be made unavailable and instructors must not make the Child Courses available in the future. If you need to unmerge your Blackboard courses you will need to contact Blackboard Support by calling 804-287-6860 or email blackboard@richmond.edu. A Blackboard Support staff person will contact you to coordinate unmerging your Blackboard courses. First determine the Parent Course. This is the course where all your content must currently reside. 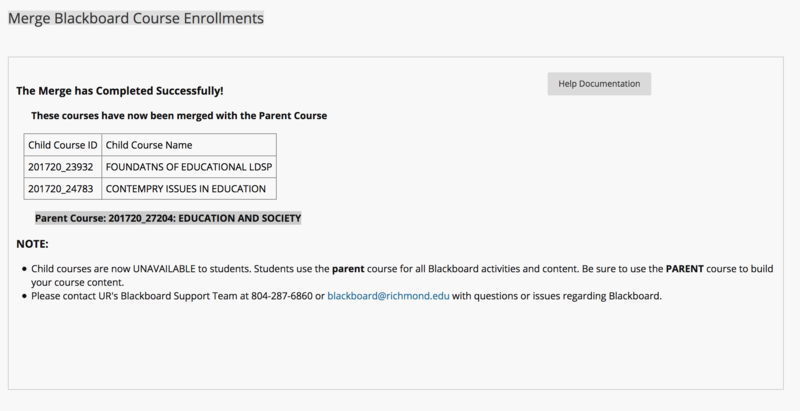 Open the Parent Course in Blackboard. Click on the Course Merge tool and the Course Merge application will start. The first screen will show you the Parent Course (the course you are currently logged into). Click on the link to select the Child Courses you want to merge into the Parent Course. On the Select Child Courses page, check the box for one or more Child Courses. You should only see courses of the same term where you are enrolled as “Instructor”. The Parent Course should not be in the list of Child Courses you can select. Click on the Confirm Merge Choices button. On the confirmation page, read over carefully which course will be the Parent and which course(s) will be the Child(ren). 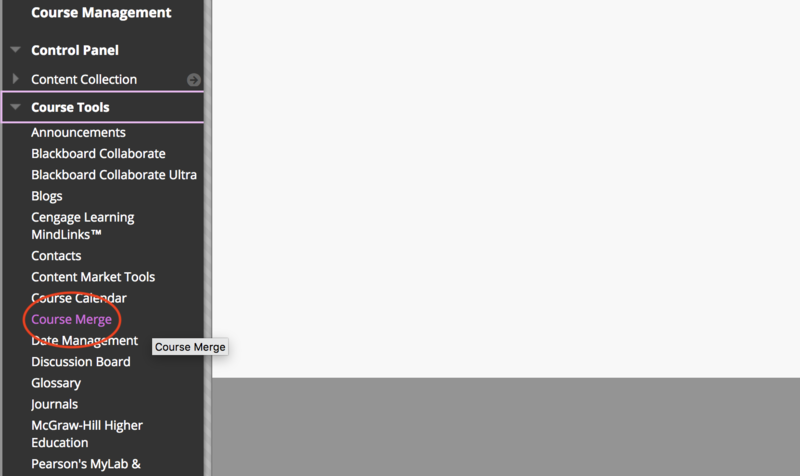 Click on the Perform Merge Courses button. You should next see the Course Merge success page. If you encounter any problems with using the Course Merge tool please contact UR’s Blackboard support team at 804-287-6860 or email Blackboard@richmond.edu. More help information can be read by clicking on the Help Documentation button at the top of this page. If 3rd-party cookies must be disabled, some browsers allow for domain exceptions to be added. Please Allow [*. ]box.com (Chrome) or https://box.com (Firefox). If you are having a problem logging into Blackboard or seeing Blackboard at all, there are few things you can do to help alleviate the problem. First, try clearing your browsers cookies and cache. Here is a link to a help resource on how to do that for the most popular browsers: http://www.refreshyourcache.com/en/home/ You also can press Control + Shift + Del on a PC or Command + Shift + Delete on a Mac. If you are still unable to access Blackboard, make sure your browser is up-to-date. Because of security and safety issues, browsers release new versions almost every month so it is important that you get your browser to the latest update. You can check here to see what the latest update is for the most popular browsers: https://updatemybrowser.org/ Please note that Blackboard will not work with Internet Explorer 10. You must have Internet Explorer 11 on your system in order to access Blackboard. If you have tried all the above and still are having a problem connecting, please contact the University Help Desk to help resolve your problem. After the maintenance down time on December 29th, the following change will be reflected in the inline grading feature in Blackboard. Blackboard’s current service for the implementation of inline grading is through the Crocodoc tool, and Box Inc. (who owns it) has decided to discontinue it. The end-of-life date for Crocodoc is January 15, 2018. As a result, Blackboard has updated their inline grading capability to leverage the Crocodoc replacement, “Box View”. Box View oﬀers several improvements over Crocodoc, including improved rendering ﬁdelity and expanded support for new ﬁle types. The University of Richmond will update our server on December 29th and move to the new Box View. During this time between December 29, 2017 and January 15, 2018, the Crocodoc service and ability to view previously annotated documents within a browser won’t be available but the rest of Blackboard will function properly. The document viewing capabilities are the only feature aﬀected during the transition. After the transition, users won’t be able to change the existing annotations made in Crocodoc as all annotations are read-only in the new Box View. The Crocodoc annotations are “burned” into a PDF and users can’t remove or change the annotations. Users can add new annotations with the New Box View annotation tools, but they can’t interact with annotations created in Crocodoc. …must assign grades, before students can view annotations. …can’t edit or remove existing Crocodoc annotations in New Box View as the annotations are “burned” into a PDF during migration. …can add or edit New Box View annotations after a grade is assigned. However, when delegated grading is enabled, only instructors can add or edit annotations in New Box View after grades are assigned. We understand that may have come to rely on Crocodoc when they do inline grading in Blackboard. After we upgrade, the transition to the new Box View will be as seamless as possible. Crocodoc will not be available for a few minutes and then New Box View replaces Crocodoc in the affected course grading areas. After the end-of-life date for Crocodoc, what will happen to data stored in Crocodoc if an older Blackboard assignment isn’t updated to use Box View? While the Crocodoc service will technically reach end-of-life, the databases that contain student-submitted data and documents won’t be deleted or destroyed. Blackboard is working with Box to deﬁne a long-term strategy for the decommission of Crocodoc servers permanently. While we don’t have a timeline available yet, we have no expectation of a decommission of Crocodoc servers. After the end-of-life date for Crocodoc and during the migration, what will instructors see in a course if Blackboard isn’t updated to use Box View? After the end-of-life date and during the migration, the Crocodoc service will display a “Service Unavailable” message to users. New Box View will completely replace the Crocodoc feature in Blackboard, with the same general user experience and interface elements. Users will see some slight diﬀerences, primarily more streamlined buttons and options. You shouldn’t expect significant change management for your users. Some users may not notice the change at all due to the similar nature of the UI between the two services. Will the transition have any impact on the use of rubrics for grading? Will instructors be able to use the same rubrics for Box View as they currently do for Crocodoc? The transition won’t impact Blackboard’s rubrics or rubric data. Instructors will be able to use the same rubrics within the inline grading interface alongside the new Box View service. Rubrics are a separate feature that doesn’t share code with the Crocodoc or new Box View service. To access Blackboard you should use your NetID (network ID) and network password (the same credentials you use to access university email). Do not use your University ID (number that is on your OneCard ID) and its password. If you do not remember your network ID and/or your network password, or if you are unable to access Blackboard using your network credentials, you can try to use the self-service tool at http://webpass.richmond.edu or contact the Help Desk at 804-287-6400 for assistance.